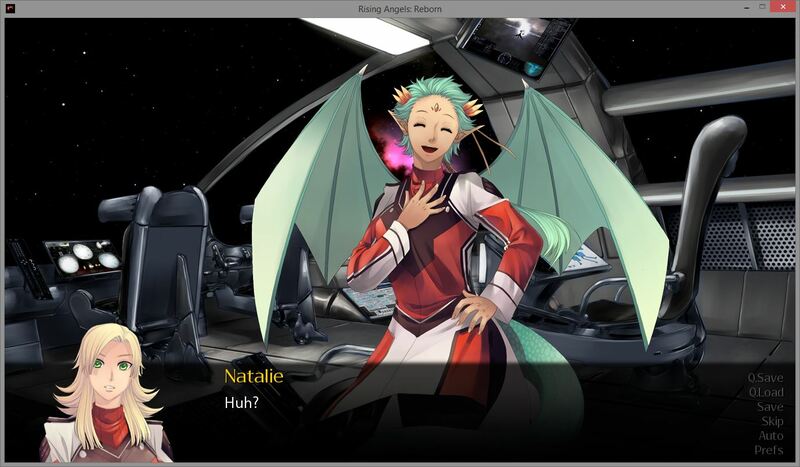 Natalie Puccile, a Special Investigations and Tactics officer with the Katajion Directorship, has spent her career watching over a listening post in the middle of deep space. After the orders that she has always dreamed of finally arrive, she finds herself in charge of a small destroyer and tasked with discovering the fate of a missing research team investigating an ancient civilization. As the situation falls apart around her, it is up to Natalie’s brilliance and the dedication of the crew of the KSS Nimross to avert a galaxy-shattering event that could spell the end of all space travel. With determination in her heart, Natalie rises to the chance to beat back the danger and perhaps find love in the twinkling lights of the distant stars. -Rising Angels: Reborn is a remake of the Rising Angels series. You don’t have to have played the original. Video of the post is the song I’m humming in the background as I eat my victory cake. We made the deadline, damn it! The android and voiced version will be released later this year. Plot: Smoothing out the last of the script right now. Wordcount is ending at roughly 70k. The story is very heavily an adventure tale, romance playing a backseat. I use the terms “otome” and “yuri”, but that’s only talking about the character pairings in the story. A long talk with our sprite artist has led me to conclude that I have been improperly using those words. When we do our release, I’m going to avoid using those terms since the game is not about pursuing a romantic relationship… but the story of a young woman and an assignment gone wrong. Who says you can’t teach an old chief new tricks? I have no idea, because I’m still a young whippersnapper. Sprites: I’m already drafting up my dream sheet for the next one. For those of you who liked the defunct Anton’s Vacation, a crossover is pretty much assured. Music: I finished coding the music in just now. Twenty two songs total. I think we’ve got a beautiful, diverse soundtrack. VA: A couple of the voice actors are done and the rest are hard at work. Kylie’s voice is absolutely adorable, it makes me wish she had a larger role! Misc: Testing has pretty much been wrapped up. We may be permitting early access for a couple folks, but there isn’t any big plan for it. That’s it for this week. Expect a new update in the next few days. The video of the post contains some cursing, but it is a pretty awesome song. It’s time for the weekly report. By gosh, has it been a painful week for me. Good for all of you, agony for me. 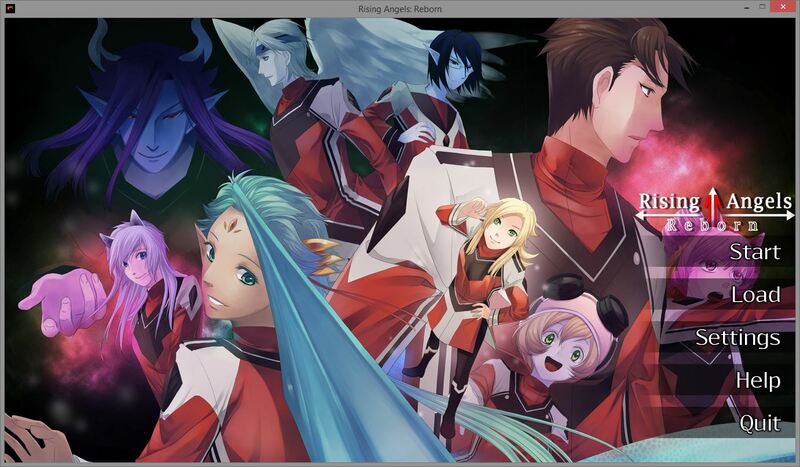 Plot: Zuri’s route is completely finished! Sprites: Sprites for another game have been done. There’s a bishoujo/yuri game (a short one this time) already lining up in the pipe. Coding: Not just the script, but the whole damn thing is ready for primetime. I’ve spent the good portion of the week dealing with positioning and emotions. Long. Painful. Necessary. When I thought I was done, I realized that I hadn’t done Natalie, which meant that I had to go back and add all of her side sprites. I now know what code monkey hell is like. VA: All of the roles have been cast. Right now, I’m going through the script and highlighting the lines for everyone. This week has been dull repetitive task week. Misc: I’m going to be sending out the preview to testers here shortly. Okay. No more typing for now. My fingers hurt. Until next week! Video of the week? I almost didn’t put one up because I was too busy trying to find the answer. It’s time for the weekly report! I bet you all thought I forgot. Well, you’d be right. I’m still here on-time, so it doesn’t matter! Wordcount: 58,000; we are one day’s worth of writing from making this longer than Rising Angels: The Red Rose. I don’t know if that counts as a success at tenacity or a failure of sticking to development plans on making this short. Plot: Wrote the second “bad” end for Zuri’s route. I don’t think it is a bad ending, but it certainly is sad. I should be done with Zuri in the next day or two. Then we move on to Sol. Music: Just doing all of the conversions to .OGG. CG: We are 2.5/10 completed. Sprites: I really need to remove this section from the update… Concept design on the next IDHAS game has been started. Doesn’t really relate to this update, but I’m bored and figured that I should add something in this completed category. Coding: We’re over 5.5k lines of dialog. This is a long, bloody death march of coding. Progress is being made and we are growing closer to the end. Misc: Since Zuri’s route is almost completed, I am now looking for reviewers/proofreaders to look at and review the story so far. There will be a voiced version of the story released a few weeks after the unvoiced version. I want to give a special thanks to Annie Quinn for volunteering to help us with this! To wrap everything up, here’s the second ever piece of fan art I’ve ever received! Thanks, propanoll! And for the video of the post, let’s go with the song playing in my head.